On Wednesday night I gave a public presentation at the scheduled Evening Program, one of 2 required of the artists. I think about 40 people came, some from the nearby town of Estes Park. The talk was in the Beaver Meadows Visitor Center auditorium. I was helped by Betsy and Roger Leverton, volunteers who work in the various visitor centers and help introduce the artist talks. Roger dealt with technical issues- loading my Powerpoint presentation of photos into their computer, showing me the wireless microphone and wireless remote control to advance the slides. Roger gave a brief history of the artist-in-residence program in the national parks and Betsy introduced me with a very nice summary. I showed some photos from my “day job” at AFP then went into more detail with the night sky and astronomical shots. I give another program next Wednesday, so this was a good rehearsal. I stopped by the Beaver Meadows center briefly Thursday and noticed a flyer announcing the artist talk, with my picture on it, attached to the outdoor bathroom doors. I guess I’ll take any kind of publicity. After the talk Wednesday night, I drove up the Trail Ridge Road to shoot photos from the various overlooks on the road. During my drive on Trail Ridge Tuesday, it was quite windy, so I wasn’t expecting to take many photos. I reached a viewoint called Forest Canyon that has a 360 view of the area. It was also quite cold, probably 10 degrees colder than down near the cabin. The wind was blowing, just strong enough to make the photography difficult. I took a few shots, then retreated to the car to warm up and have some cookies from my backpack. Plus the moon wasn’t going to rise for another 2 hours. When I went back out, the wind had died down and it was quite clear out. 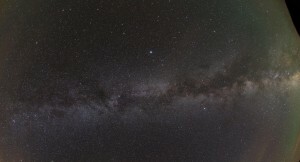 I set up my equipment, getting some nice Milky Way photos. 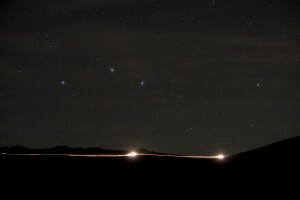 The Big Dipper hung just above the ridge to the north. Being annoyed by the occasional car on the Ridge road (who is out after midnight except crazy photographers?) 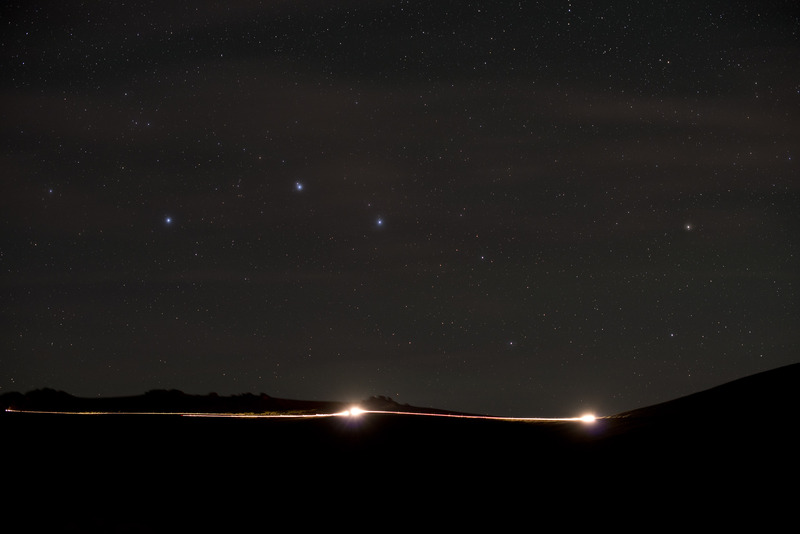 I realized it might make a nice photo of the highway and the constellation. The moon rose almost behind me, as it crested the mountain I thought it was another car on the road it was so bright. I managed to finish about 2:30am and headed back to the cabin.